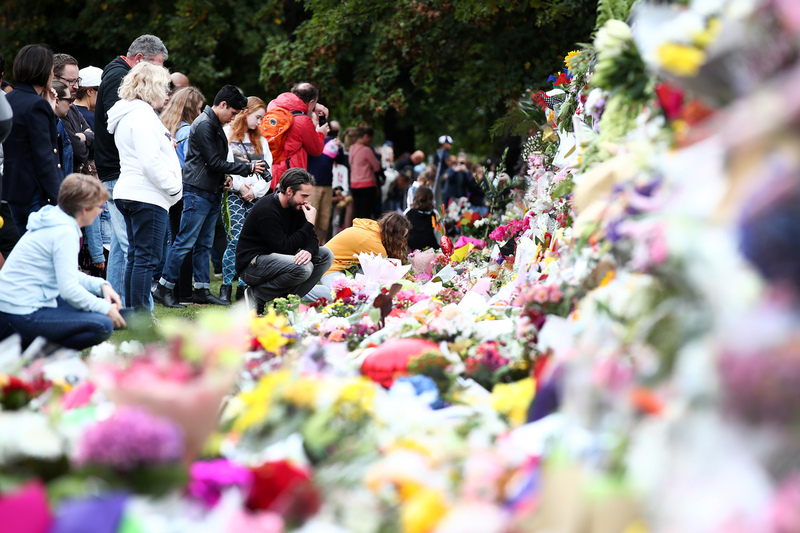 Christchurch Mourns After Shooting Christchurch's residents are coming to terms with Friday's shooting that killed at least 50 people. Many are showing support for the Muslim community, which is struggling to process the attacks. People lay flowers at a memorial for the mosque attack victims on Sunday in Christchurch, New Zealand. Inside a crisis center for families of the victims, hundreds of family members and dozens of survivors embraced each other on Sunday and cried. Some were seeing each other for the first time since the attack. Family members and survivors started sharing their stories. One man in his 50s said that bodies had started piling up on top of him, and he wasn't sure how he avoided being hit by a bullet. Another man, Adam Ibrahim Diriye, spoke about his young son, Muaaz Adam Ibrahim, who had been hiding with him during the rampage. Upon hearing gunshots, the boy stood up to see the source of the noise and was shot. He was only three years old. He died about a month shy of his fourth birthday. When the gunshots faded, Diriye picked up his son and cradled him in his arms. Diriye kept whispering into his ear, "God is sufficient, he is my protector. God is sufficient, he is my protector." To show solidarity, a Christian group of Maori — New Zealand's indigenous Polynesian people — arrived at the crisis center to perform a traditional Haka dance. In the dance, Maori men stomp their feet and raise their arms in the air, chanting defiantly. But tears streamed down their faces while they danced. Outside of the center, the city of Christchurch has joined together in unity. A message is left among flowers and tributes by the wall of the Botanic Gardens in Christchurch, New Zealand. In front of the city's botanical gardens, residents have left countless flowers, candles and letters of support for their Muslim neighbors. Some letters are as simple as a card saying "You Belong." Others are longer, such as one signed from "The Barnes family" that says, "This atrocity affects us all, because we are you and you are us ... We are one. We must stand in solidarity and together." Local resident Alan Truman brought flowers from his own garden. He remembers the last tragedy that affected the community — the 2011 earthquakes that killed nearly 200 people. He said this incident felt worse. "The earthquakes were one thing, but this just — this is human. This is hatred," Truman said. "We're a proud city. We're resilient. But this has rocked us to our knees." On Sunday, Prime Minister Jacinda Ardern visited the Islamic community within the capital city of Wellington. Wearing a black hijab, Ardern joined a crowd that came to pay their respects. Before meeting with Islamic community leaders, Ardern started hugging members of the community and laid flowers on the steps to the mosque. Prime Minister Jacinda Ardern hugs a mosque-goer at the Kilbirnie Mosque on Sunday in Wellington, New Zealand. 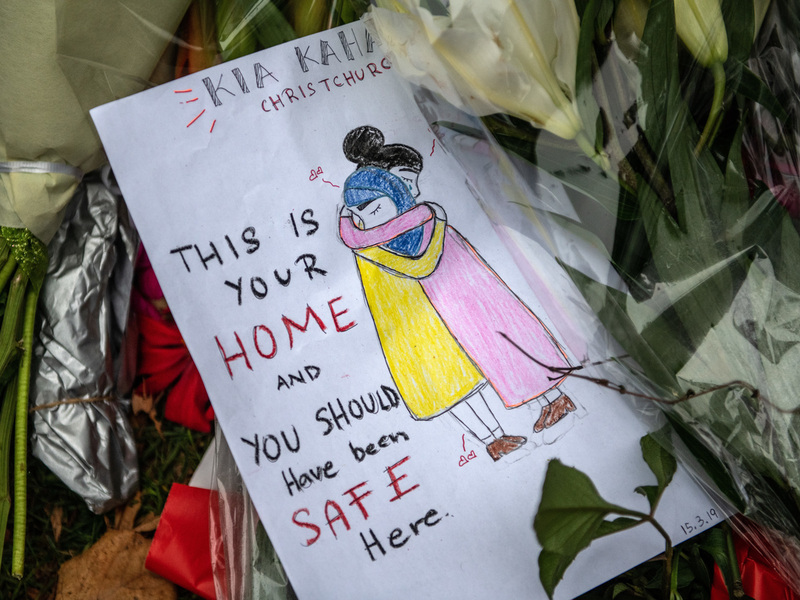 Following the attacks, Ardern condemned the shooting and said on Friday, "There is no place in New Zealand for such acts of extreme and unprecedented violence." She has continued to speak out against the attacks and has vowed to tighten New Zealand's gun laws. Despite the outpouring of support, some in the nation's Muslim community are having trouble feeling safe. Sheikh Faraz has not slept in two days. He attended the Al Noor mosque, where the majority of victims were killed. Many were his friends. Now, he and his wife are in turmoil, unsure how to process the pain. "We were crying and crying, until we can't cry anymore and we can't sleep either," he said. "The kids are asking, 'What's going on, dad?' and I said, 'Something's gone wrong, not right, and we're trying to make it right,' and we don't want to let them know what's happened." Faraz said he doesn't know how to talk to his children about the attack. 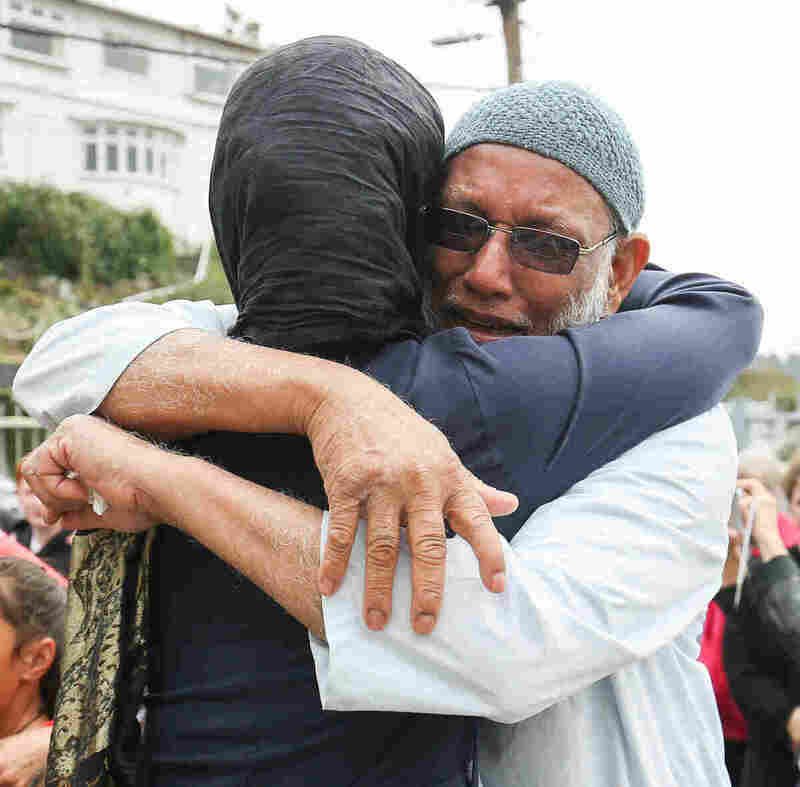 To deal with the pain, he has been making constant runs to the airport on behalf of the Christchurch Islamic community, picking up Muslims who arrive every hour from throughout New Zealand. But now even the smallest tasks can set off panic for Faraz. On Saturday, he went grocery shopping, and said he kept worrying about the potential for someone to shoot up the market. Faraz said he never felt this way before. He used to feel safe in New Zealand. Methon Noor (right) embraces a friend for support. So did Methon Noor, an immigrant from Bangladesh who lost at least five of his friends in Friday's attack. "Now it's like feel not safe here. Because we thinking somewhere somebody come and can shoot again," Noor said. 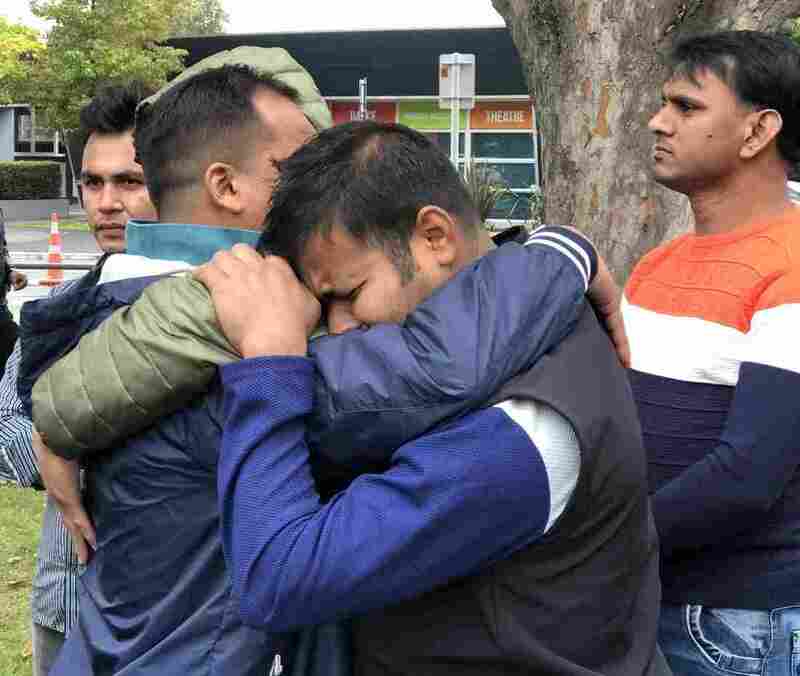 There aren't many Bangladeshis living in Christchurch, Noor said, so he considered his friends to be his family. The mosque was at the center of their lives, community and relationships to each other. Noor is still looking for a sixth friend who has been missing since Friday's attacks. He fears his best friend was killed, but is waiting on confirmation. "Last night we was in hospital. They told us this morning we'd get the final information finally, but it's still not happening," Noor said. "We are still waiting here." After saying this, Noor began sobbing and could no longer speak. Muslims from around New Zealand have arrived in Christchurch to help console family members and survivors. Imam Ajad Ali flew into town from Auckland after finding out that several of his friends were among those killed in the attack. He traveled to to Christchurch to help his friends' families. "They all are, of course, crying, and are really hurt," he said. "Many of them have seen the videos of the killer who recorded everything and sent it to the social media. That's affecting them a lot as well." Ali was one of five men sitting on the floor on Sunday morning in the Rasol-O-Allah Islamic Center, which was not attacked on Friday. Wearing traditional Islamic clothing, the men joined together for a breakfast of naan, potatoes and black tea. The five are from around the world — Afghanistan, Pakistan, Fiji — but they all became New Zealand citizens for the same reason: to practice their faith in peace. They believed they could do so in New Zealand. Now, that belief has been shaken.